The 471st Special Operations Wing is an inactive United States Air Force wing. The wing was formed through the consolidation of the 471st Bombardment Group and the 581st Air Resupply and Communications Wing. The 471st Bombardment Group was a World War II heavy bombardment replacement training unit, last assigned to the First Air Force at Westover Field, Massachusetts, where it was disbanded on 10 April 1944. The 581st Air Resupply and Communications Wing was a United States Air Force special operations wing, last assigned to Thirteenth Air Force at Clark Air Base, Philippines. The 471st Bombardment Group was activated at Alexandria Army Air Base, Louisiana in the spring of 1943 with the 805th, 806th, 807th, and 808th Bombardment Squadrons assigned. The group operated as a Consolidated B-24 Liberator replacement training unit. Replacement training units were oversized units which trained aircrews prior to their deployment to combat theaters. In January 1944, Second Air Force began to concentrate on Boeing B-29 Superfortress training. 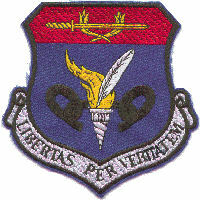 The 471st was reassigned to First Air Force and moved to Westover Field, Massachusetts. Training at Westover included long range overwater formation flights. However, the Army Air Forces found that standard military units, based on relatively inflexible tables of organization were proving less well adapted to the training mission. Accordingly, a more functional system was adopted in which each base was organized into a separate numbered unit. This resulted in the 471st, along with other units at Westover, being disbanded in the spring of 1944 and being replaced by the 112th AAF Base Unit (Bombardment (Heavy)), which assumed the group's mission, personnel, and equipment. In 1951, the USAF created the 581st Air Resupply and Communications Wing at Mountain Home Air Force Base, Idaho. The wing consisted of an operational group assigned four units. The 581st Air Resupply & Communications Squadron (ARCS), the 581st Airborne Materials Assembly Squadron, the 581st Holding and Briefing Squadron, and the 581st Reproduction Squadron. The mission of the 581st ARS was the infiltration, resupply, and exfiltration of guerrilla-type personnel, and the aerial delivery of psychological warfare (PSYWAR) material (leaflets and other similar materials). The wing was also assigned two support groups a communications squadron and a maintenance squadron. In early 1952, the 581st received orders to forward deploy to Clark AB, Philippines, and to be assigned to Thirteenth Air Force. The first air resupply and communications wing to deploy overseas, the composite wing arrived at Clark AB, stripped of its support groups and communications squadron, in July 1952. It retained four squadrons specifically tailored to perform the special operations mission and a maintenance squadron. Shortly before deploying, the 581st Air Resupply and Communications Group was reduced to a paper organization and its squadrons were attached to the wing. Of the five squadrons assigned or attached to the wing, the 581st ARCS was the lone squadron devoted to flying operations. The 581st Wing proved to be flexible, and its initial theater deployment plan, outlined in Far East Command Operations Plan (OPLAN) 3–52, capitalized on this flexibility. The OPLAN established a concept of covert operations for theater forward deployment of assigned 581st ARCW assets. A key function of the wing was to maintain the capability to introduce special agents and guerrilla units into Communist countries and Communist-held areas, to supply them by and guerrilla units operating there, and to keep in contact with them by radio for the Central Intelligence Agency (CIA). The mission to introduce and extract special agents into Communist countries operated under the cover of psychological warfare, providing cover against inquiries into their clandestine purpose. Four of the wing's twelve Boeing B-29 Superfortresses, and associated support personnel were placed on a 60-day rotation schedule to Yokota Air Base, Japan, where they were co-located with the 91st Strategic Reconnaissance Squadron, which also flew the B-29. The wing's B-29s were retrofitted to allow cargo or human "drops" and were stripped of armament, with the exception of the tail gun, and countermeasures in order to lighten their load and increase altitude and range. One crew member was trained as a CIA contact, known as the jumpmaster. The identities of these jumpmasters were kept secret, even from the wing commander who did not know of their CIA connection. However, the wing had a senior officer serving as a liaison with the CIA. This was Lt. Colonel George Pittman, whose identity was also kept secret from those who did not have a need to know. The wing's planes were painted solid black after their arrival at Clark AFB, and they flew long-range leaflet drop missions over North Korea. PSYWAR “leaflet bombs” were loaded with various forms of PSYWAR materiel and then airdropped from high altitude. An altitude-sensitive fuse opened the container at a predetermined set altitude, dependent on pre-mission forecast winds and desired dispersal patterns. One of the most sensational missions of the 581st in Korea occurred on 12 January 1953, when a 581st B-29 (tail number 44-62217, call sign "Stardust Four Zero") on its first leaflet drop mission with the Wing Commander, Col. John Arnold (as well as the commander of the 91st Strategic Reconnaissance Wing, Major William (Bill) Baumer) on board, was shot down on their last leaflet target just south of the Yalu River in far northern Korea near the Chinese town of Antung. At the time, Russian fighter squadrons, some equipped for night flying, were supporting and supplying the Chinese with airpower. Twelve Russian MiG-15s from the 351st (and perhaps the 535th) Fighter Air Regiments intercepted the lone Superfortress south of the Yalu River, about 15 miles from the Chinese border. The MiGs were scrambled and vectored to the bomber's location by Russian radar-controlled searchlight units stationed near Antung, China. The searchlights illuminated the unarmed Superfortress and several MiGs engaged the bomber. Russian MiG pilot Senior Lt. Khabiev of the 351st regiment was credited with the intercept and downing of the B-29. Although US sources believe the B-29 was flying in North Korean airspace at the time of its mayday call, a belief that is strongly disputed by the Chinese and Russian authorities, crew members who bailed out believe they landed in North Korean territory. Upon capture, the crew was rounded up, blindfolded and put aboard trucks, subsequently transported into China and later charged as CIA spies (the Chinese subsequently learned of the CIA connection with the air resupply units). During the highly publicized Chinese trial in Baijing in October 1954, the surviving crew members, along with captured CIA agents Fecteau and Downey, who were imprisoned two years earlier after they had been shot down while attempting to pick up their Chinese double agent, were given prison sentences ranging from 5 years to life. Not until 4 August 1955, two years after the Korean War Armistice, were the surviving Stardust Four Zero crew members released from Chinese prison. These crew members were the longest held POW USAF captives of the war. Beginning in 1953, however, the wing's C-119s began to be employed in Southeast Asia in support of French operations in Indochina. Supplies, including ammunition, vehicles, and barbed wire, were delivered to Haiphong Airfield in ever increasing quantities. As this operation was underway, the wing was inactivated and its 581st Air Resupply Group, which received the wing's remaining assets, was transferred to control of Thirteenth Air Force. Inactivated on 8 September 1953. ^ The Helicopter Flight and SA-16 Flight of the 581st Air Resupply Squadron received the Korean Service Steamer for their actions in Korea, but the rest of the wing did not. ^ "Abstract, History 804 Bombardment Squadron Jan-Feb 1944". Air Force History Index. Retrieved 2 October 2013. Craven, Wesley F; Cate, James L, eds. (1955). The Army Air Forces in World War II. Vol. VI, Men & Planes. Chicago, Illinois: University of Chicago Press. LCCN 48-3657. Goss, William A. (1955). "The Organization and its Responsibilities, Chapter 2 The AAF". In Craven, Wesley F; Cate, James L. (eds.). The Army Air Forces in World War II (PDF). Vol. VI, Men & Planes. Chicago, IL: University of Chicago Press. LCCN 48003657. OCLC 704158. Retrieved 17 December 2016. Fletcher, Harry R (1993). Air Force Bases , Vol. II, Air Bases Outside the United States of America (PDF). Washington, DC: Center for Air Force History. ISBN 0-912799-53-6. Brown, Wallace L. (1961). The Endless Hours. The Vail-Ballou Press, WW Horton & Co. Inc., NY, NY. Baumer, William H. (1999). The Extended Mission of Stardust Four Zero, Closson Press. ISBN 0-9704359-1-6. Haas, Michael E. (2000). In The Devil's Shadow-U.N. Special Operations During The Korean War. Naval Institute Press, Annapolis, Maryland. Haas, Michael, E. (1997). Apollo's Warriors US Air Force Special Operations During The Korean War. Air University Press, Maxwell Air Force Base, Alabama. Price, Alfred (1989). The History Of US Electronic Warfare, The Resaissance Years, 1946–1964. The Association of Old Crows. The Col. Arnold Story. Burns, Robert. (1998).